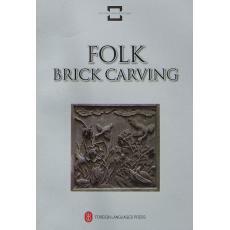 Brick carving is a special genre of art extensive applied in architectural décor, especially of the traditional type. Collected in this book are more than 200 beautiful pictures covering a full range of topicality such as carving on screen walls, windows and doors, eaves and rooftops, as well as stucco sculpture and glazed bricks, exuding great artistic appeal. The book, prefaced by a treatise, is designed as part of the efforts to pass on and advance China’s tradition culture, and may also serve as a reference for artists and designers.